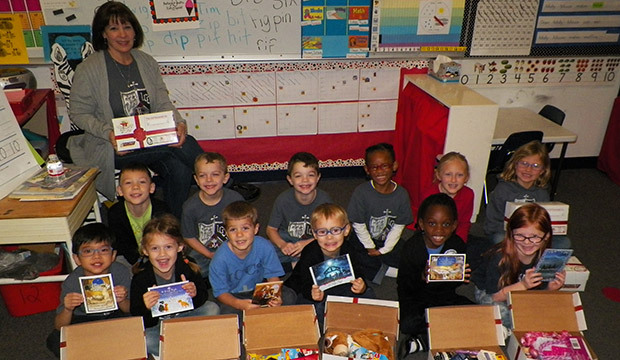 DENTON — For the second year, students at Immaculate Conception Catholic School in Denton conducted some research: how much joy could they squeeze into a shoebox? 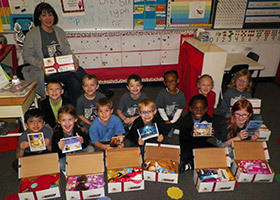 The pre-K through eighth-grade students gathered small toys, school supplies, hygiene items, and candy and packed them into shoeboxes for Cross Catholic Outreach’s Boxes of Joy program. The boxes are distributed to children in Central America, Haiti, and the Dominican Republic. Elaine Schad, principal of Immaculate Conception, explained that last year the school looked for a service project to help children affected by the devastation of Hurricane Maria. Boxes of Joy fit the bill. Also, the project gave each student a first-hand opportunity to make a positive difference for a child living in poverty. Each class assembled at least two care packages, and then they put a final item into each shoebox: a photo of the class who sponsored that box. About 70 boxes were assembled by the students, and community members dropped off about 10 more at the school before the care packages were shipped to Cross Catholic’s distribution center. Students gathered more joy than would fit in their boxes, so the bounty will be shared locally, too. Extra items will be funneled to Catholic Charities Fort Worth, Loreto House, and the Denton County Homeless Veteran Outreach Program.